Wikimania, the annual congress bringing together the Wikipedia planet took place from August 9th to 13th. This Wikimania event has had its effects in the community of libraries and archives in Quebec. Not only among our QC colleagues, of course, since close to a hundred of them converged on Montreal, from around the world with the leisure of building a tailor-made professional program. As one colleague pointed out: “Wikimania is really a good congress of librarians.” And a congress would not be good if it did not give us the occasion to reflect on some substantive questions on the main theme, but also on the meaning of the profession, and sometimes even beyond. 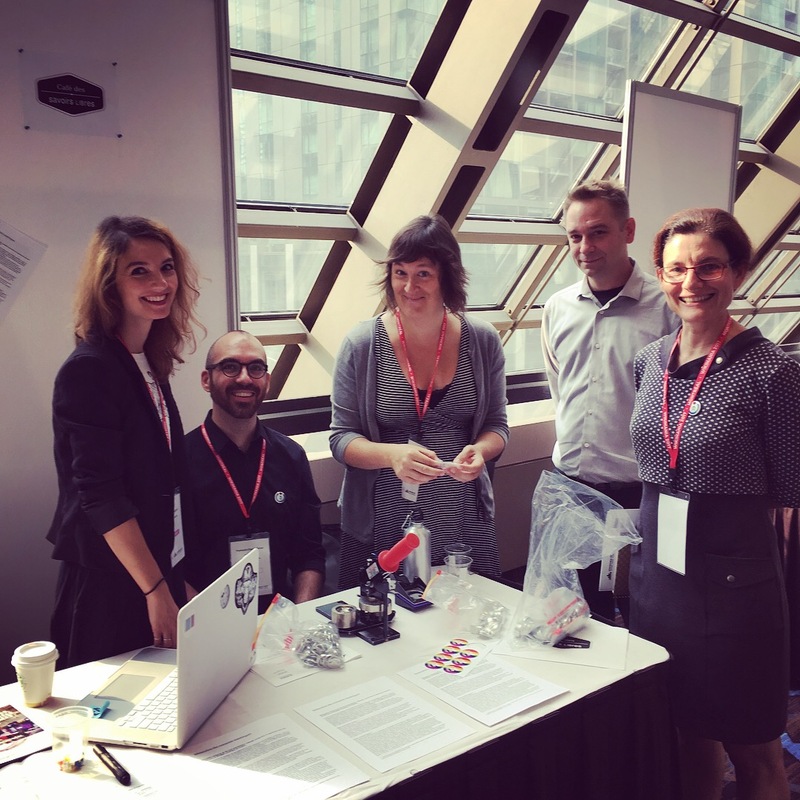 After several years of wiki experimentations, this event provided an opportunity to take stock of the relationship between QC libraries and Wikimedia Foundation projects. The conferences of Maureen Clapperton and Hélène Laverdure with Frédéric Giulano have clearly demonstrated the extent and relevance of this partnership between Bibliothèque et Archives nationales du Québec and Wikimedia Canada. In a different perspective, the conference by Ivan Filion, director of Montreal Libraries, presented the results of a few years of exploration of the wikiway in public libraries, drawing on the expertise of some twenty contributing workshops/editathon—which is considerable for the same institution. In light of these findings, a second phase is envisaged for this network through: 1. a new series of contributive workshops; 2. a day of co-learning “libraries and Wikipedia” for the staff members concerned; 3. event initiatives that would support, in a new fashion, the creation of commons; and a particularly attentive role to strengthen 4. the presence of literary culture in Montreal, Quebec and local history on Wikipedia. My colleague François Charbonnier and I took over to present the genealogy of our experiences in the design of digital communities and the evolution of the social configuration of our workshops involving both Wikipedia and OpenStreetMap. Jean-Michel Lapointe (UQAM Central Library) closed this session involving local speakers with a reflection about editorial cultures: scholars, students and wikipedians, based on his observations on them, exposing the mutual enrichment potential of their, often unlikely, cohabitation. You can view several of the presentations and have access to the slides. All the products of the conferences are gathered on the site of Wikimania. In the wake of these talks, a Wikipedia Aime les Bibliothèques (WAB) workshop was held in a, sold-out event, inspired by the Wikipedia Loves Libraries (WLL) initiatives, which aim to accelerate the convergence of these two partners since 2013. Organized in collaboration with the EBSI, Montreal Libraries, and the Café des savoirs libres (CSL), thirty-seven participants took part in this activity, which sought to bring library and archive staff together for the purpose of 1) discussing the relationship between these institutions and the Wikimedia Foundation projects by sharing experiences in Quebec and elsewhere; and 2) exploring new avenues of action to promote collaboration between libraries, archives and the Wikipedia community by supporting their involvement in the movement of open culture and free knowledge. Among the elements that emerged from this meeting, we note that the epistemic resistance is no longer a reason not to Wikipedia, that the mobilization of the participants is very tangible and that they were ready to go further and even to include the other libraries in Quebec in the move, for example. And as we could hear in the institutional discourse on an international scale, the issue is less concerned now with the motivation to adhere than the question: how to do it? How to design the learning activities, how to accompany the development of the Wikipedia skills of professionals. Should we not be able to rely on professional associations, Library and Information Science Schools, our peers? How can we build a platform for support and sharing of our professional experiences? How could we create a common display on Wikipedia, for example a page bringing together all of our projects in libraries in Quebec in order to inform citizens and project promoters about the different activities, and to bring some emulation among them? The day ended with a promise to extend this interest in the fall of 2017 around a contributory day aimed at both conducting a training workshop – which was the third objective of the WAB/WLL meeting but which could not have taken place at this time, since exchanges and feedbacks were more numerous and sustained than expected -. Then, we hope to be able to specify the articulation of possible mechanisms and feasible projects in response to the questions raised earlier. This upcoming event will lay the groundwork for a network of wikimedien.ne.s QC + librarians, in a still informal but more organized way. As I mentioned earlier, the nature of the discussions at the WAB/WLL workshop is consistent with the findings from an international perspective. In recent years, library initiatives have grown on an individual basis, as Alex Stinson, a GLAM-Wiki (GLAM for Galleries, Libraries, Archives, Museums) strategist at the Wikimedia Foundation (WMF), emphasized in a workshop. His presentation is available. I would add to this observation that signs of structuring, or expectations in this respect, from an organizational point of view, are also quite evident. Building on its authority, IFLA published its White Paper in February 2017 as a guide, with promising orientations, and a sampling of various existing collaborations between Wikipedia and libraries all over the world. IFLA has similarly promoted campaign # 1lib1ref 2017 which encouraged librarians to add sources to Wikipedia. With this in mind, OCLC’s ambitious Wikipedia + Libraries: Better Together Program, which has been providing webinars for two years now, is preparing to step up its approach with an online training of 10 sessions to train 500 librarians In the United States this autumn as part of a study funded by the Knight Foundation. Alex Stinson pointed out, however, that for library initiatives until now, “Most models focus on extracting unique knowledge from institutions, not building a professional practice”). What is interesting in this observation is that it means a resolutely traditional conception of libraries oriented on the collections that are deposited in a container. With these deposits of archives, digital collections, and data in the Wikipedia apparatus, libraries, paradoxically, maintain a vision that they seek to put at a distance in the discourse they convey in the 21st century. So when Stinson asks, “Where are we going now?” “Or ‘How to scale our relationship with libraries?’, should this extractive approach still serve as a response? And if the question is to answer it: should the alternative question not be translated as ‘How could our relationship with librarians be scaled up? “And the possible answer is, in my opinion, rooted in the same perplexity that Stinson manifested in the current collection-centred model, and would be to look for ways to build a wikipedian professional practice, instead of emphasizing wiki-libraries, in order to have a more sensitive and probably more sustainable impact. Indeed, the most sustainable bet would no longer be based exclusively on the addition of digital collections and data, but without excluding it! (especially in the context of current development surrounding Wikidata), but on the exploration of another model than the extraction’s one. The challenge of this alternative model, on the other hand, is that it has to be built—as one becomes wiki median with some time. It does not rely solely on processes, but also on an approach or mindset. It refers us to a global transition that goes beyond the situation of the Wikipedia projects, which they are the laboratory, and which brings the professional practice to rethink the relationship maintained with the territorial and global community and to rethink shared governance based on the approach of the commons. Wikipedia is neither an aggregate of collaborative knowledge, nor a simple community portal, but above all an innovative model of governance. This governance obviously carries with it the question of the power and control of knowledge by virtue of rules other than those inherited from the institutions. But many of the latest are already experimenting them in their fab labs, seed libraries, etc. It sets up a collaborative matrix between the library and the community, which engages them through a project in which they are also involved as co-creators. This reciprocal commitment involves a social mediation of the knowledge contained in the community. It makes it possible to shift the expertise up to favour the co-emergence of knowledge with regard, in particular, to those who belong to the less socially visible groups—but not the least experts. It implies a shift in relation from a service delivery logic, mainly imposed and rarely co-produced (lending digital collections/lending spaces to hold activities) to a vision of the library able to support the creative capacities of citizens in a place that is endowed with social attributes as a forum and third place. If public policies support this vision strategically, resources will be prioritized to promote open culture, free knowledge, common knowledge—even perhaps from the situation of socially excluded groups. These are some elements likely to contribute to the alternative model of a wikipedian/wiki median professional practice, or a practice of the commons, which is to build it in a library. And if we look towards other institutions: archives, museums, etc. Where are we in GLAMs more generally? In another workshop on GLAMs this time, Alex Stinson acknowledged that a problem of another order is emerging for the Galleries, Archives, Museums (GAMs) if one compares with the situation of the libraries. Actually, it seems that the wiki community is faced with the challenge of bringing in institutions of cultural heritage other than libraries. In other words, if the challenge of libraries, which are well engaged, is to scale up, the challenge of the GAMs is still to engage themselves. In this context, it could be suggested that the success of libraries has been linked, among other things, to the fact that the WMF has designed a niche approach with these through initiatives such as Wiki loves libraries (WLL). An analogous approach would be to develop a targeted approach of the same type, for example “Wiki loves museums” and “Wiki loves archives” in order to initiate and catalyze the commitment of these hesitant institutions. It is a voice that is already being explored in the Quebec context, and in the wake of the WAB/WLL event, some organizations with significant archives have come forward to discuss the interest of GLAMs and the relevance of an initiative “Wiki loves archives” in order to joined the movement. On the other hand, if the “L”, the libraries, succeed in meeting the challenge of designing a Wikipedia practice, perhaps this experience will also facilitate the way for other participants, galleries, archives, museums in order to scaling up for a common global knowledge policy. To the credit of the archives, two contributory days deserve to be highlighted and organized by Wikimedia Canada in partnership with the Bibliothèque et Archives Nationales du Québec, the Atikamekw Nation Council, the Manawan Atikamekw Council, National Institute of Scientific Research (INRS), Rising Voices with the collaboration of the Libraries of Montreal. First, the Scan-a-thon, where five endangered archives, including nearly nine hundred negatives illustrating the life of the First Nations from Abitibi and Mauricie between 1936 and 1952, as well as others types of documents, have been proposed for digitization and uploading into Commons and Wikisource. This workshop was followed by a edit-a-thon to accompany First Nations members and their allies in improving the content in Wikipedia related to the first. The issue of Wikimedians-in-residence lurked around the topics discussed here, and it would certainly have deserved an article alone. To be continued.